Summer is almost over, but it doesn't mean you can't dress up like you do in summer, you can still be classically stylish in this coming Fall. I like to lightly layer my outfit in dark shade for fall since fall is all about boots, dark polishes, and a touch of grungy look. Speaking of the outfit, I'm wearing grunge shirt as outer from Cotton On and my favourite part is that the pockets have spiky studs, which i thought it's really cool! 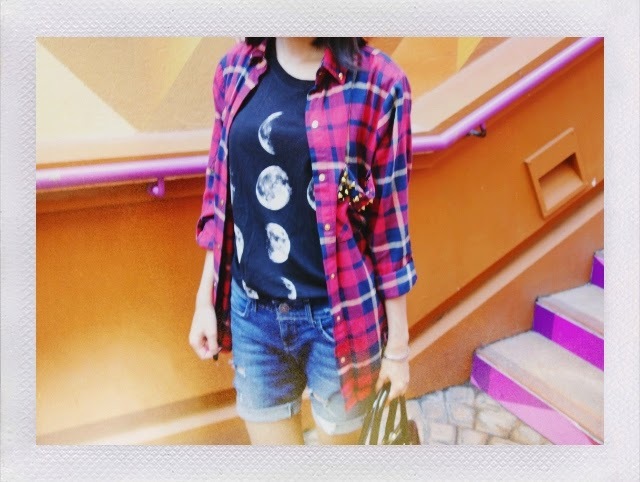 I'm wearing a black tank underneath that has moon print on it from Forever 21 as well as my glasses and my glossy bag. Last but not least, Fall will not be grungy without ripped jeans! These shorts I made by myself from my old jeans (here's the video for you) and I like to pair it with dressy casual men shoes. So, those are my five fall favourites that I'm looking forward to wearing this early fall and you can also get this outfit by using gift cards that are offered by Raise.com, which you can easily purchase your favourite retailers through gift cards such as H&M, Cotton On, Forever 21, and many more with a great discounted price! And you can always sell your unwanted gift cards for cash at Raise! Rock your style with your favourite fall collection and Happy shopping y'all! I see Typo behind you! I looooove that store! Cool outfit, love the sunglasses and the bag! love ur outerwear! the photos look so amazing! mind to check my blog out as well? chic comfy look for everyday ! !